Dr B R Ambedkar first visited LSE in 1916, returned in 1921 and submitted his doctoral thesis in 1923. 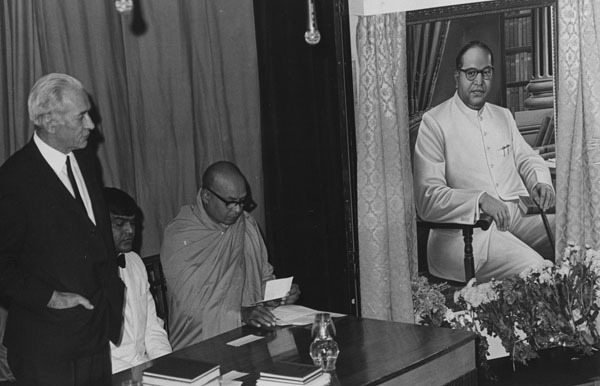 LSE Archivist Sue Donnelly investigates Dr B R Ambedkar’s life at LSE. Despite this B R Ambedkar registered for a master’s degree and completed a PhD thesis on his second attempt to study at LSE. 2016 marks the 125th anniversary of B R Ambedkar’s birth in 1891 and the centenary of his first visit to LSE in 1916. Ambedkar was born into a family from a so-called “untouchable” caste. Ambedkar became a social reformer and architect of the Indian constitution. After studying at Elphinstone High School in Bombay he was the first Dalit to enrol at Elphinstone College and the University of Bombay taking a degree in economics and political science. In 1913 he was awarded a Baroda State Scholarship and moved to Columbia University, New York, completing a masters in 1913 and a thesis, National Dividend of India-A Historic and Analytical Study in 1916. 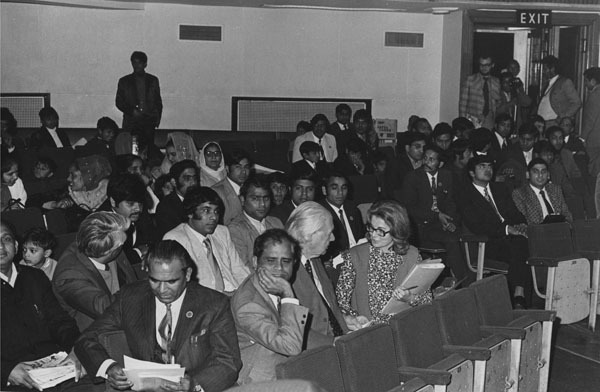 A desire to undertake research into the history of Indian finance and currency led Ambedkar to study in London where a wider range of research sources would be available. In 1916 he registered at LSE for a master’s degree and took courses in Geography with Halford Mackinder, and Political Ideas with G Lowes Dickinson, alongside Social Evolution and Social Theory with Professor LT Hobhouse. The fees for the course were £10 10s. At the same time Ambedkar enrolled for the bar course at Gray’s Inn. In 1916 LSE was only 21 years old but with a high reputation in the social sciences and for its international student body, in 1913-1914 142 students had come from outside of the Britain. The outbreak of the First World War had impacted on the work of the School and student numbers had fallen by almost half to around 800. Ambedkar’s studies were interrupted as he was recalled to India to serve as Military Secretary in Baroda and in July 1917 the University of London gave him leave of absence of up to four years. In 1920 Ambedkar returned to LSE after working as professor of political economy at Sydenham College in Mumbai and giving evidence to the Scarborough Committee preparing the 1919 Government of India Act on the position and representation of “untouchable” communities. Initially he applied to complete his masters degree and write a thesis on The Provincial Decentralisation of Imperial Finance in India. His fees had gone up by a guinea to £11 11s. 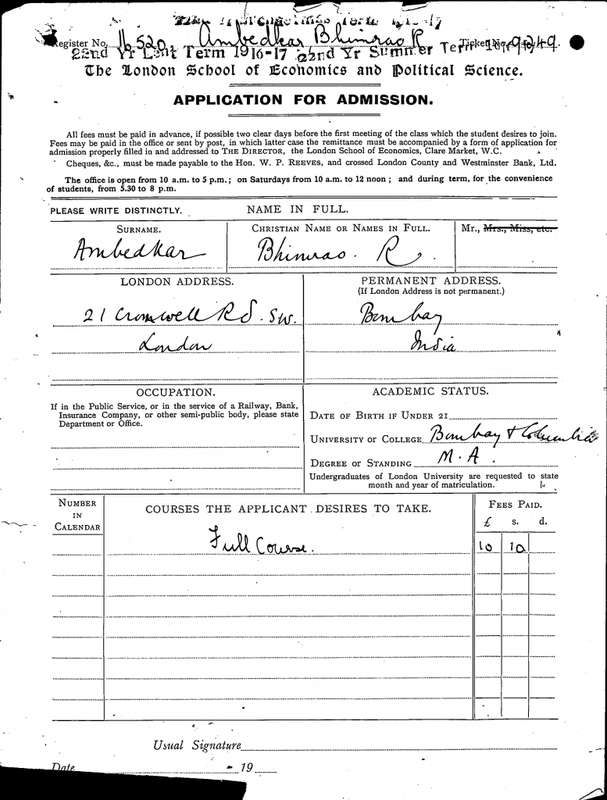 There was a slight glitch in his LSE career in April 1921 when he failed to send in his form for the summer examinations and the School Secretary, Mrs Mair, had to write to University of London’s Academic Registrar for permission to submit the form late. In economics Ambedkar’s tutors included Professor Edwin Cannan and Professor Herbert Foxwell both of whom had taught at the School since its opening in 1895. He would also have met Theodore Gregory who began as an assistant in economics but became Cassell Reader in International Trade in 1920. Gregory became an economic advisor in India from 1938-1946. Ambedkar finally submitted his doctoral thesis, The Problem of the Rupee, in March 1923 but it was not recommended for acceptance. Reports claim that the thesis was too revolutionary and anti-British for the examiners. However there is no indication of this in Ambedkar’s student file. The thesis was resubmitted in August 1923 and accepted in November 1923. It was published almost immediately and in the preface Ambedkar noted “my deep sense of gratitude to my teacher, Professor Edwin Cannan “noting that Cannan’s “severe examination of my theoretical discussions has saved me from many an error”. Cannan repaid the complement by writing the Foreword to the thesis in which he found “a stimulating freshness” even if he disagreed with some of the arguments. 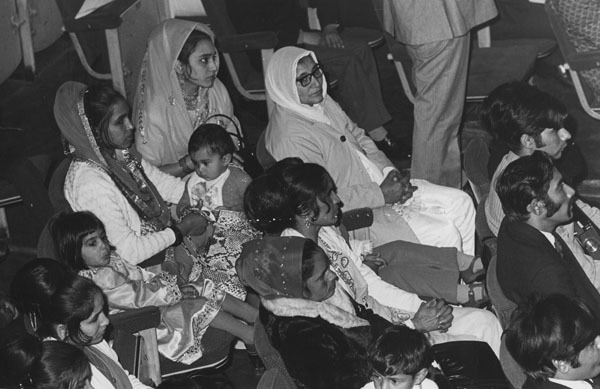 After his success Ambedkar returned to India where he was prominent in the campaign for Indian independence and opposing discrimination for Dalit communities. In 1947 he became the first Law Minister of independent India and was Chairman of the Constitution Drafting Committee. 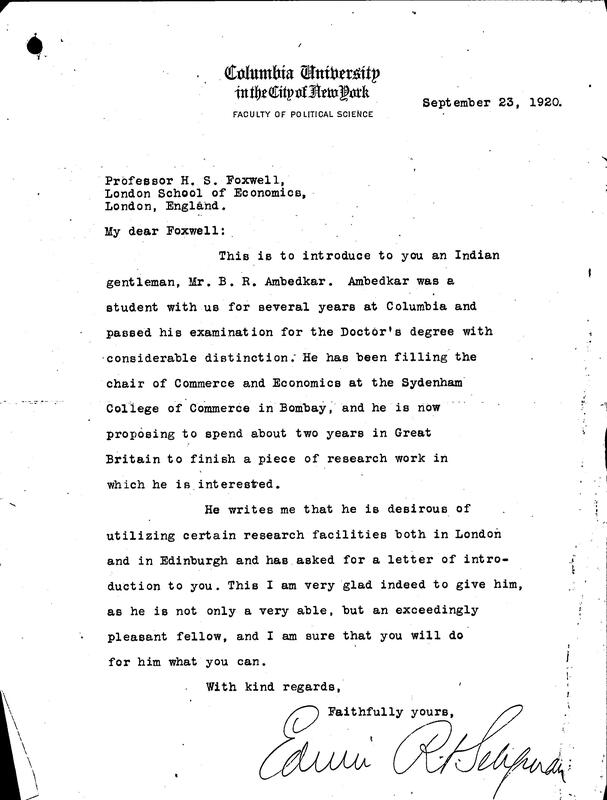 LSE continued to take an interest in his career and in 1932 the Director, William Beveridge, wrote to Professor Cannan that Ambedkar had been invited to the School by John Coatman, Professor of Imperial Economic Relations, formerly director of public information for the Indian Police Service and the British government in India, to meet Professor Gregory while attending the roundtable discussions on the Indian constitution. In 1973 a portrait of B R Ambedkar was unveiled in the lobby to Clement House. 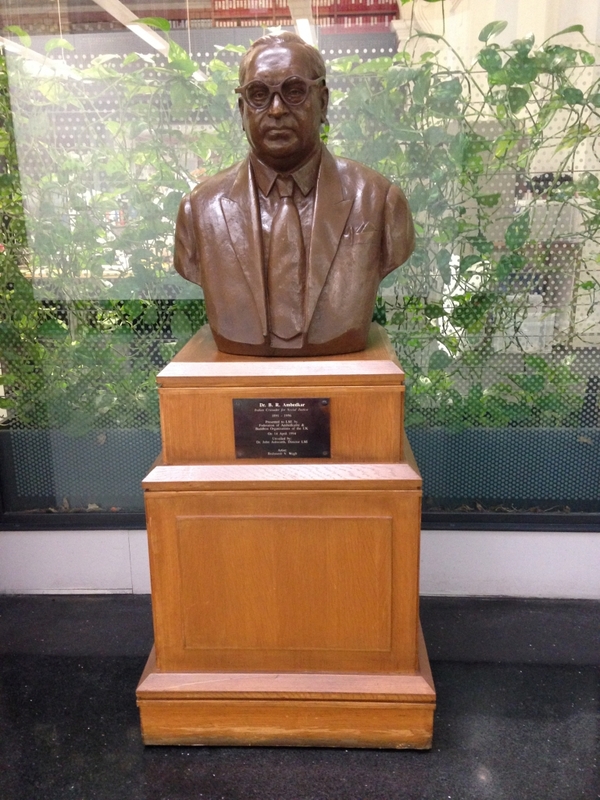 A bust unveiled in 1994 is currently displayed in the Atrium Gallery of the Old Building. Dr. Ambedkar was great revolutionary Student who oppose wrong policies of British Government in student life. Ambedkar finally submitted his doctoral thesis, The Problem of the Rupee , in March 1923 but it was not recommended for acceptance. Reports claim that the thesis was too revolutionary and anti-British for the examiners. Dr. Ambedkar didn’t popularise the term Dalit. He hardly used term Dalit instead he preferred Scheduled castes or Untouchable. Dalit term became famous in early 70s with the rise of Dalit Panthers movement in India. The title of this piece speak the lot… ‘No More Worlds Here for Him to Conquer’ – Dr BR Ambedkar at LSE. A phenomenally inspiring individual who achieved so much for so many. “Not only very able but exceedingly pleasant fellow” to a foreigner beyond all kinds oppression he underwent in his home country. A genious and revolutionary thinker much ahead of his time. History will remember him for long. Dr. babasaheb Ambedkar was Ultimate man for India. I Read “The problem of Rupees”. sir im saluting you. i got many good knowledge from this book. Thank you for the information but it was not Dr. Ambedkar who popularise the term Dalit. Dalit term became the household name after Dalit Panthers in 1970s. Baba saheb ambedkar is the most intellectual person and he design the society of human how to live on earth with equality fraternity and freedom. And he give the new ideas to society of the world, to creat something new for benefits of the human and for their betterment. Dr. B. R. Ambedkar was and is the voice of voice less. I adore him for his interpretation of Freedom and justice. He can be compared to himself and none. Dr BR AMBEDKAR was a person who had proved that one untouchable can write thesis of PhD from prestigious university LSE at the time when India was under British ruling.Even some people who believe in casteisms are not appreciate his work..
A great son of India. I think he should have become the 1st Prime Minister of India.